Correct interpretation of zircon ages from high-grade metamorphic terrains poses a major challenge because of the differential response of the U–Pb system to metamorphism, and many aspects like pressure–temperature conditions, metamorphic mineral transformations and textural properties of the zircon crystals have to be explored. 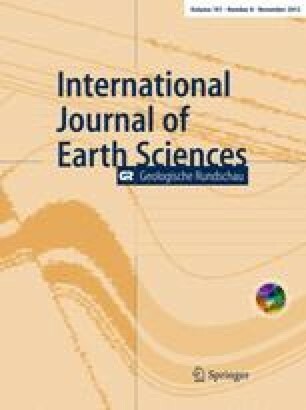 A large (c. 450 km2) coherent migmatite complex was recently discovered in the Bohemian Massif, Central European Variscides. Rocks from this complex are characterized by granulite- and amphibolite-facies mineral assemblages and, based on compositional and isotopic trends, are identified as the remnants of a magma body derived from mixing between tonalite and supracrustal rocks. Zircon crystals from the migmatites are exclusively large (200–400 μm) and yield 207Pb/206Pb evaporation ages between 342–328 Ma and single-grain zircon fractions analysed by U–Pb ID-TIMS method plot along the concordia curve between 342 and 325 Ma. High-resolution U–Pb SHRIMP analyses substantiate the existence of a resolvable age variability and yield older 206Pb/238U ages (342–330 Ma, weighted mean age = 333.6 ± 3.1 Ma) for inner zone domains without relict cores and younger 206Pb/238U ages (333–320 Ma, weighted mean age = 326.0 ± 2.8 Ma) for rim domains. Pre-metamorphic cores were identified only in one sample (206Pb/238U ages at 375.0 ± 3.9, 420.3 ± 4.4 and 426.2 ± 4.4 Ma). Most zircon ages bracket the time span between granulite-facies metamorphism in the Bohemian Massif (~345 Ma) and the late-Variscan anatectic overprint (Bavarian phase, ~325 Ma). It is argued that pre-existing zircon was variously affected by these metamorphic events and that primary magmatic growth zones were replaced by secondary textures as a result of diffusion reaction processes and replacement of zircon by dissolution and recrystallization followed by new zircon rim growth. Collectively, the results show that the zircons equilibrated during high-grade metamorphism and record partial loss of radiogenic Pb during post-peak granulite events and new growth under subsequent anatectic conditions. S. Eroglu, A. Frew, E. Kiemele and E. Reitter are thanked for help during isotope analyses. We are grateful to G. Markl, M. Marks, G. Propach and T. Wenzel for support and fruitful discussions and to F. Corfu, F. Finger, Th. Geisler-Wierwille, K. Mezger, I. Williams and two anonymous reviewers for critical comments. This research has been benefitted from financial support of the Bayerische Landesamt für Umwelt.